Most online bingo halls offer an additional aspect to the game called chat games. 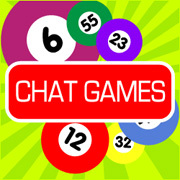 Chat games are a fun, interactive addition to the online bingo gaming experience utilizing the chat box in the game room. Online bingo chat games offer an additional way to earn bonus points, which accumulated over time add up to free money, and as such, are only available to players who have made at least one deposit and are playing real money games. There are dozens of various chat games that can be played, always hosted by a chat monitor working for the online bingo hall you’re playing at. The names of these chat games may vary, depending on which online bingo hall you are playing at, but the rules are basically the same. Choose any two numbers that add up to 21, (19 and 2 for example) at the start of the game. As soon as the announcers calls your two numbers, enter “BLACKJACK” and both of the numbers you have chosen into the chat. Before the game starts, choose any one of the letters from the word “bingo.” The first time any number is called that contains the letter you have chosen, type “ALPHABET SOUP” along with the number called. If you’re the first to do so, you win the chat game. Each player picks three numbers that are in a row from the bingo board. If the announcer calls out your numbers, enter “TTT” along with your numbers into the chat box. In GIN each player picks 3 numbers before the game starts- one from the “G” column, another from the “I” column, and a third from the “N” column. The first player who’s numbers are called during the game and types “GIN” along with their chosen numbers into the chat wins. This is just an example of a few of the chat games available. There are dozens, possibly even hundreds of chat games available to play in any online bingo hall, and new ones being invented all the time. If you enjoy the social interaction of the chat rooms while you’re playing bingo, then make sure to click here and try out some of the chat games. It’s a great way to add a little extra fun to the game, and earn some free money in the process.